Hope you had a chance to read my defensive preview. Here is a position-by-position breakdown of the Redblacks offence. Hank is gone, but the team’s QB corps is solid thanks to GM Marcel Desjardins’ timely acquisitions of Trevor Harris prior to the 2016 season and Drew Tate this past winter. After spending 2016 as the most loyal of soldiers alternately backing up and replacing Henry Burris, this is now Harris’ football team. The offence is being molded to his strengths and we’ll get a good sense this year if Harris is as good as good over 18 games as he’s been as a part-timer. Beneath the optimism about Harris, there is an undercurrent of chatter that he has never delivered for an entire season. I can’t comment on his 2015 experience with the Argos other than to know he dissected the very strong Redblacks defence twice later in the season. As for last year, he was injured at some point after he took over for the injured Henry Burris, and it is difficult to pin the team’s mid-season struggles on Harris. This having been said, this is his first opportunity to lead a pro team from the beginning – his performance one way or another will speak for itself. I expect Harris will deliver, particularly with Ottawa opening up deep threats (despite the departure of Chris Williams). 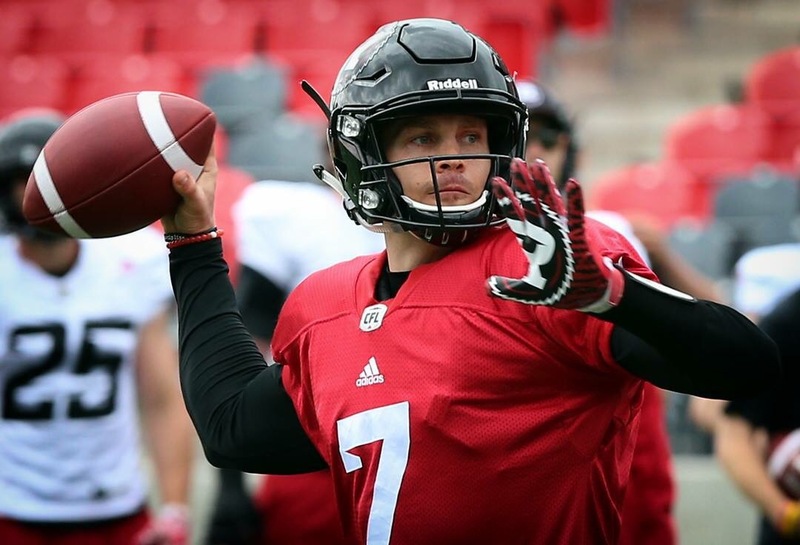 I’m assuming that former Calgary back-up QB Tate is now the defacto #2 in Ottawa, although it may depend on how Ryan Lindley adapts to the Canadian game. Lindley’s NFL record isn’t stellar – he’s had 6 starts over three seasons and he is no longer in the NFL for a reason. This is a fresh chance for the San Diego State product and he’ll be able to compete. Brock Jensen, the incumbent #2/3 in Ottawa, is also back. It remains to be seen whether he gets a chance to prove his smattering of supporters correct that he is proving worthy of the #2 spot and is a future starter. Attentive readers will know I’m more than a little dubious. There are two things the Redblacks have been able to count on through their short history – sellouts at TD Place and the need for lots of running backs. Fortunately, Desjardins has been able to keep the RB pipeline full despite a string of injuries. This year he has delivered the team’s deepest RB corps yet. 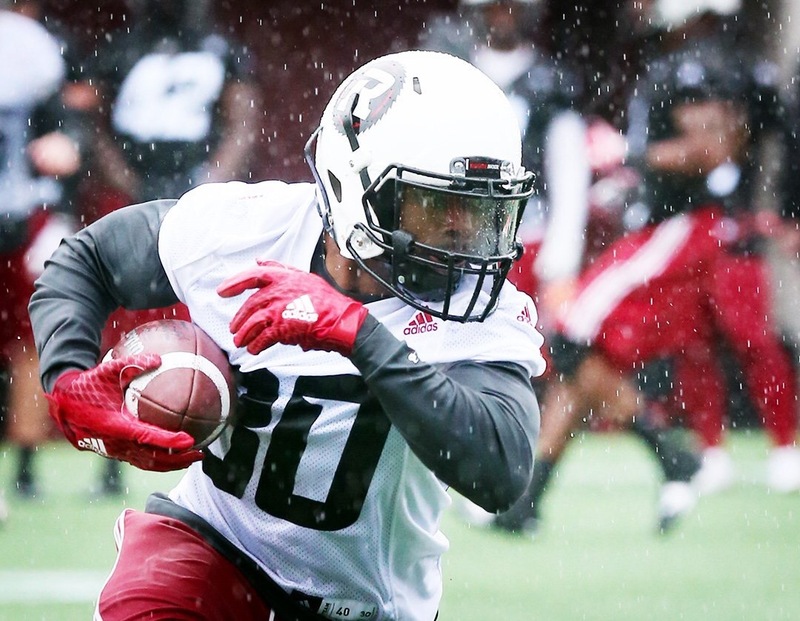 With Mossis Madu returning after a solid championship season and William Powell returning following his early season injury, it would appear that the Redblacks were already loaded at RB prior to the signing of Shakir Bell. Now they are uber-loaded, but two things to remember: Injuries come fast, and both Madu and Powell are now 29 years old. We could be looking at a training camp battle between Madu and Powell to hang on to one spot alongside Bell, who is younger and has shown explosive ability to gain yardage. Bell was CFL Player of the Week in week 10 last season, and certainly turned heads, but with only four starts so far he’ll have to prove in camp that he isn’t a flash in the pan. He was a talented big time back in college, however, so all signs point to Bell being the real deal. 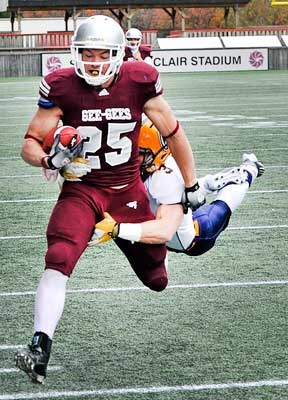 A wild card this year is Anthony Gosselin, a physical specimen drafted in the second round by the Redblacks in March. Gosselin will certainly contribute almost immediately on special teams, but it must be wondered if the team thinks it might have another big Canadian back on its hands in the mold of Jerome Messam – Gosselin is almost 250lbs, has defensive lineman strength and running back speed. He’ll be a player to watch. Running back is the number one position to watch during training camp as the Madu-Powell-Bell hierarchy gets sorted out over the next month. We simply have to get over the departed players. They’ve earned a lifetime of respect, love and glory, but they are Redblacks no more. Hail the new Redblacks. The 2017 version of the Redblacks offence should remain strong thanks to depth – just like the previous two seasons, opposition defences cannot shut down the Ottawa air game by focusing on one or two receivers. It is entirely possible the Redblacks will have another season with four 1000+ yard receivers. As hard as it may be to accept, this is a time of out with the old, in with the new. Expect 2016 late season standout Juron Criner to ably step into the role previously occupied by Ernest Jackson. The big converted TE has proven to have good hands and the ability to get open. He will never be EJack, but the Redblacks will be well served by Criner. With Chris Williams leaving just as Harris’ ability to throw deep with accuracy comes to the fore, I was concerned about the Redblacks not having legit deep threats. I worry no more. Diontae Spencer and Kenny Shaw provide that deep threat. As long as the Redblacks receiving corps continues to take downfield blocking as seriously as catching and running, the team’s air game will remain very strong. YAC has been a big plus for the Redblacks offence over the past two seasons, and that needs to continue. The one concern is lack of Canadian depth behind Brad Sinopoli. We’ll see if Scott McDonnell can step up when asked in his third year with the club. Greg Ellingson is now making big time money and should continue delivering big time results. And snow angels. Lots more snow angels. The real training camp battle will be for the depth roles – ie, who will be the “first man up”. Matt Albright and Alex Mateas will be fighting to be that guy, with Mateas having a lot to prove. The 2015 first overall draft pick is proving to be an expensive backup. This is a make or break year for the Ottawa native, and indeed, anything could happen if a camp prospect such as Lene Maiava proves to be a beast worth keeping, despite his International status. Look for Albright to be the go-to depth guy, and remember that versatile standout MacMillan only signed for one season. The team will have to be thinking about next year as well. Tommie Draheim filled in last season when RT Jake Silas was injured. Tackles need very strong first contact and the mobility/balance to stay with the defender. 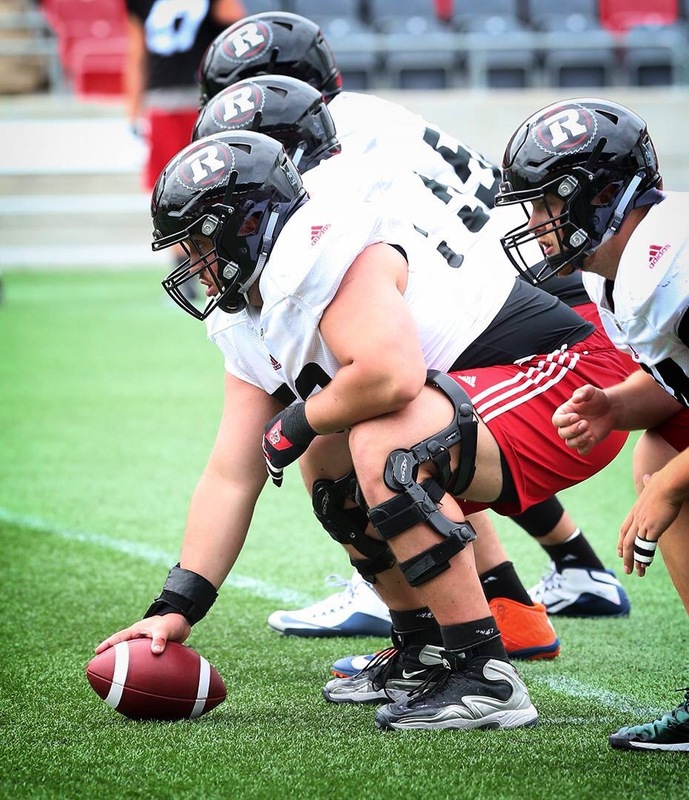 The Redblacks will be taking a long look at camp invitees at tackle to see who might deliver those qualities and be the depth player at OT. Don’t look for first round draft pick Evan Johnson to make an impact this season. He has lauded athleticism and coach Bryan Chiu will be able to coach him up, but there likely won’t be a regular season role for him until 2018, at least. Looking forward to Saturday’s mock game and Thursday’s preseason opener. Come say hi – and don’t forget to rub my shoe for good luck! Follow me on Twitter at @CrankyClair. If there’s one thing you can say for certain about Ottawa Redblacks GM Marcel Desjardins it’s that he doesn’t mess around. When a need is identified, he fills it. In 2015, it was the signing of four high-profile receivers (and trading for a fifth) along with the best left tackle available in SirVincent Rogers. When DE Aston Whiteside went down with an injury at mid-season, Shawn Lemon was signed and in town days later. 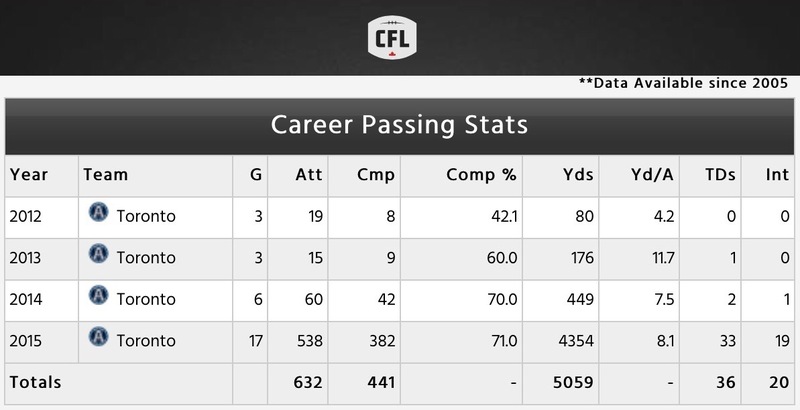 His 71% completion percentage and 33 TD passes last year were both tops in the CFL. Ottawa fans are likely quite familiar with Harris, who led the Argos to a 3-0 record against the Redblacks, including torching them for 397 yards and 5 TDs in the infamous Argos ‘home’ game played at TD Place in Ottawa on October 6th. 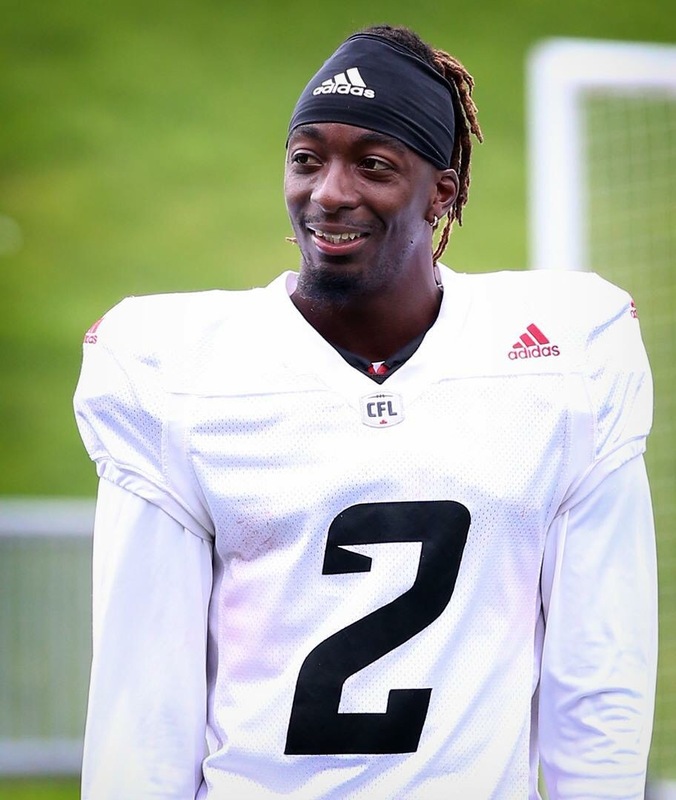 While contract figures are never officially official in the CFL, reports have it that Harris’ two-year deal is weighted heavily in the second year (to the tune of $400,000). Makes perfect sense, as the QB job is (and rightfully should be) Henry Burris’ in 2016. The plan is for Harris to serve as back-up to Burris this season, taking over the reigns as starting QB in 2017. And, as he told TSN 1200 Tuesday afternoon, Harris is completely on board with the plan. Desjardins got his man and the Redblacks QB position looks set for at least the next couple years. Though the signing (made official later Tuesday afternoon) didn’t capture many headlines, the Redblacks also added FB Brendan Gillanders, also ex of the Argos. The Ottawa (Orleans) native and University of Ottawa Gee Gees product will fill the open FB position (Jordan Verdone will not be back) and play a key role on Bob Dyce’s revamped special teams unit. In his second pro season, Gillanders appeared in 17 games, compiling 14 special teams tackles. He added another 104 yards on 7 catches in a limited offensive role. UPDATE: Forgot to note Gillanders was the Argos special teams captain in 2015. Thanks to this piece from Gord Holder for the reminder. DL Keith Shologan (WPG) and DB Jovon Johnson (MTL) were the first two now-former Redblacks to sign elsewhere. Both played significant roles in the franchise’s first two seasons and will be missed. The re-signing of DL Zack Evans signalled the end of Shologan’s time in Ottawa, while moving on from Johnson may be an indication the Redblacks will try to get bigger in the secondary. Randy Ambrosie the CFL’s first feminist commissioner?